If you haven't already, please consider joining my email list. Receive special offers, free or discounted tickets, and be the first to find out what's happening! Hard to believe it's already time for my annual website update! I'm putting the finishing touches on my second album "Before He Was Famous," which I recorded a while ago at Debasement, a show that I ran with Emily Van Dyke and Rajeev Dhar for a couple years in a residential basement in San Francisco. It's been sitting in editing limbo forever, but I'm aiming to have it out soon. Hi guys, Here are a few quick updates: Through the end of the month, 100% of the proceeds of album sales will be donated to your choice of the ACLU or Foster Campbell's senate campaign in Louisiana. I think this will become an ongoing thing. I'll pick some new causes every month. Click on the "Daddy Issues" tab on your left. Here's a feature Salt Lake Underground Magazine ran on me when I was out there earlier this year. Daddy Issues is now available! Woo hoo! Confetti! Noisemakers! Making out with strangers! Spent all last week in Las Vegas at the World Series of Comedy. That is about 5 days too many in Vegas. I made it to Friday, but did not make it through to the finals on Saturday. It was nice to see JR De Guzman, and Ellis Rodriguez, two Sacramento comics, advance to the finals though. Northern California was well represented. Ellis ended up finishing third. Glad to be home. The October schedule is pretty light right now, but will fill in. Preview clip of the intro for Daddy Issues, which will be out later this month! I'm producing a new Monthly (sorta) comedy show at The Empress Theatre in Vallejo this Friday. 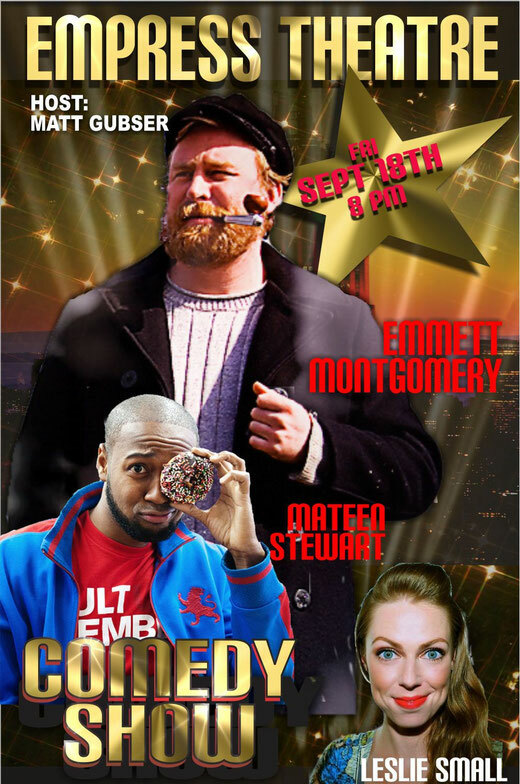 I've got Emmett Montgomery (Seattle Weekly's Best Comedian, Last Comic Standing) in town to headline, and Mateen Stewart (Jimmy Kimmel Live) up to feature. We'll be bouncing around the Bay, doing shows at Doc's Lab in San Francisco on Wednesday, The Crepe Place in Santa Cruz, on Thursday, and The Empress on Friday. I'll also be headlining shows in Oakland on Wednesday and Ukiah Saturday. Next Sunday will be my first time performing at Comedy Day at Sharon Field at Golden Gate Park! Then it's immediately off to Las Vegas for the World Series of Comedy starting Monday. Only five weeks between updates! That's progress! No, seriously. Last month's swing through the Northwest was great, except that I came down with, according to WebMD, the same virus that killed all the Martians in War of the Worlds. Had to cancel a week and a half of shows when I got home. Good times! I am fortunately, back on my feet and no longer contagious. It's amazing how much eleven days off will kill your timing. Hopefully I'm not terrible for too much longer. Sticking around Northern California for the next couple months before swinging out to Orlando (and possibly a couple other cities) for a few days at the end of January. I'm awful at this. I have been staying busy though. Lots of shows coming up. 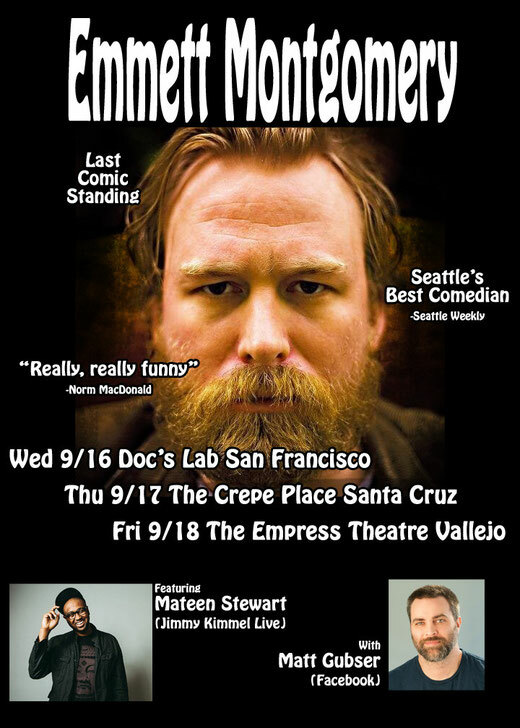 I'm about three weeks out from a Northwest swing that will take fellow Bay Area comic Leslie Small and I up through Redding, Humboldt (probably), Chico (doubtful at this point), Portland, Seattle. Nothing like a sold out crowd of 1,500. That was fun. I've also decided to scrap the album I recorded in December. I'd already decided to ditch the video and just go audio, but I'm not happy with that either. Everyone involved did a great job on it except for me. It just wasn't a good performance on my end. The jokes are better than I delivered them that night. It's an expensive lesson, but I'm not comfortable putting out a bad product, and that's what this album would have been. I'll be setting up a new recording date sometime early next year and will let everybody know when I have something more concrete. Latest video. This from Amnesia earlier in July. Behind me is the band Medicine Bug. They've been doing a lot of comedy shows around the Bay Area and will be starting up a weekly Thursday show at Milk Bar in San Francisco called Rock & Roll Comedy Jam. So much fun to work with them. Considering there was zero coordination beforehand, I think this thing turned out pretty well. Looking forward to performing with them again in September. Seriously, eight months? It's been eight months since I updated my website? That's just embarrassing. I've handed off editing of my album to someone else. It's way overdue. I unfortunately don't have the time to do that on top of everything else. I'm in the midst of a stretch where I'm performing every night. Currently 44 days in. The goal is to go until just before Thanksgiving, which will put me somewhere around 150 consecutive days. That's well short of my friend Sammy Obeid's record of 1002 consecutive nights. He's welcome to keep that one for himself. Nearly three years without a night off? Nope. All the nope. And today kicks off a two week road trip. This was supposed to begin with headlining a show in Fresno tonight, which was unfortunately rescheduled for a date I'm unavailable, so I ended up in Paso Robles. My route will take me across the southern US, with stops in Tempe, El Paso, Austin, San Marcos, New Orleans, Atlanta, Memphis, Fairview Heights (near St Louis), Oklahoma, & Albuequerque. Check out my schedule page for the full itinerary.